Update: now read our Hands on: Samsung Galaxy Tab review. Samsung has released final details of its iPad-rivalling Android tablet - the Galaxy Tab (GT-P1000). It looks like a fascinating device, a natural extension of the excellent Samsung Galaxy S smartphone that's currently giving Apple's iPhone 4 a run for its money. The Galaxy Tab heads a battalion of imminent tablet PCs and slate computers from the likes of LG, HP, MSI, Archos, Toshiba, Blackberry and ViewSonic. Here are the 10 things you need to know about Samsung's lovely 7-inch plaything. 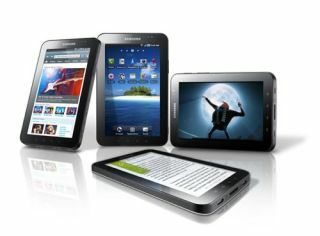 Rather than aping the 'data-only' 3G connectivity of the Apple iPad, the Samsung Galaxy Tab has more in common with the Dell Streak. With built-in GSM (850/900/1800/1900MHz) and 3G/HSDPA (7.2Mbps) connectivity, the Tab also acts as a mobile phone, supporting voice calling and SMS/MMS messaging. Throw in 802.11b/g/n Wi-Fi and Bluetooth 3.0 and the overall Samsung Galaxy Tab specification looks good. The new Galaxy Tab aims to be more portable than the Apple iPad and features a 7-inch WSVGA LCD display with a resolution of 600 x 1024 pixels. It's noticeably smaller than the iPad's roomy 9.7-inch IPS screen and it also doesn't best its 768 x 1024 pixel resolution. Good enough for HD video? You bet. Samsung lists 'full HD video playback' as one of its multimedia highlights. Because Samsung has opted for a smaller screen, the Galaxy Tab is a smaller, thinner and lighter device than the iPad. According to the spec sheet, it measures 190.09 x 120.45 x 11.98mm and weighs a mere 380g. As expected, Samsung has chosen Android 2.2 as the OS of choice on the Galaxy Tab, giving it access to over 70,000 apps in the Android Market. Alongside support for Google Maps Navigation and Google Goggles, Froyo also supports Flash 10.1 giving it a significant web browsing edge over Safari on the iPad. Samsung has also revealed that the Galaxy Tab will feature Thinkfree Office, Swype text entry and Hybrid Widgets. Like the Samsung Galaxy S, the Galaxy Tab is powered by a 1GHz ARM Cortex A8 processor (probably Samsung's Hummingbird core, although it's not directly mentioned), which gives it a decent turn of speed. The specification also includes some extra graphics muscle in the shape of a PowerVR SGX540 chip to further boost application performance. According to Samsung, the Galaxy Tab will be available in two versions – a 16GB model and a 32GB variant, both featuring 512MB of RAM. Usefully, Samsung has also built-in a memory slot, which will enable the overall memory to be boosted to 64GB with the addition of a suitable memory card. Has your iPad got a built-in camera? No. It hasn't. That said, the lowly 3 Megapixel lens fitted into the Galaxy Tab isn't worth making a song and dance about. To put things into perspective, it's on a par with the camera in the iPhone 3GS; disappointing considering that 5MP cameras are starting to become the norm. Samsung has also added a front-facing 1.3 Megapixel camera for video telephony. Four of them to be exact. The 'Readers Hub' provides access to a digital library of ebooks and is powered by technology from Kobo, PressDisplay and Zinio. This gives Tab owners access to more than 2 million books, over 2,500 magazines and more than 1,600 newspapers. The 'Media Hub' acts as a gateway to an equally in-depth e-library of films and videos, while the 'Music Hub' does the same for music. Lastly, the 'Social Hub' streamlines access to your favourite social networks. Want a specific Samsung Galaxy Tab release date? Well we can't give you one. "The Samsung Galaxy Tab will be launched in the UK in the coming months," says Samsung. 10.The Samsung Galaxy Tab price is…? Not mentioned. Why? Because the Galaxy Tab is a 3G-enabled device, it will be sold via various mobile carriers who will be free to subsidize it as they wish. This means that we could potentially see the device available for free, albeit with a hefty monthly subscription. Considering the specifications of the Galaxy Tab, it should easily undercut Apple's iPad current pricing structure. We'll have to wait and see.